10pt, 15pt, 20pt, 32pt – how much multi-touch do I actually need? Having 15pt over 10pt touch does not make it a better Interactive Flat Panel. With two-point touch you can have two students at the Interactive Flat Panel at any one time. You can use gestures like pinch to zoom and twist to rotate. There are few advantages of having 20pt touch over 10pt touch. The multi-touch experience is very much driven by the software. If you are using software that can make use of the multi-touch to its advantage, then there is of course a reason for opting for more touch points. We tend to find that outside of educational games, there’s no real need for lots of touch points. After all, there is really only enough space for three students to stand side by side and write together, even on an 86” Interactive Flat Panel! Just because you have a multi-touch screen, it doesn’t mean you have multi-touch software. The software has to be designed to be ‘multi-touch friendly.’ If you’re currently using third party software, check if you will get any additional benefits with the multi-touch screen. The ability to have an integrated PC on your Interactive Flat Panel for the most part is an aesthetic choice over a practical one. Do you need it to look a certain way? An integrated PC normally means that the PC is nicely located on the rear of the unit, out of sight. When the Interactive Flat Panel is mounted to a wall, you have no cables showing and there is no need for a shelf and an external computer. In practical terms, most teachers or classrooms have their own computer, so unless the integrated PC is going to replace one of these or upgrade it, there is no real need. That said, on the other side of the coin integrated PCs are more secure than having laptops left in the classroom if security is an issue. Many Interactive Flat Panel manufacturers are moving away from integrated PC’s. They were often more expensive than a regular computer. Now, we see the manufacturers are moving towards what is known as OPS technology. OPS stands for Open Pluggable System. This is a computer technology designed by Intel. Although it sounds rather techie, it is just a special slot on the flat panel similar to a USB port on a computer. It allows your computer to communicate with the flat panel. To illustrate how this works, think about when you want a wireless mouse to communicate with your computer. You plug a special little piece that comes with the mouse into a USB slot on the computer. And like magic the mouse controls the computer screen. Now think of plugging a piece that comes with your computer, into the OPS slot on the flat screen. And like magic the computer sends info to the flat panel. This means schools can save money and time. How? You can shop around and find the best computer at the right price for you. You don’t need to buy it from the same place or manufacturer you are buying the flat panel from. Also, if there is a problem with the computer, pull it out of the slot, and push in a new one – it is that simple. Full HD, UHD or 4K? All three of these terms refer to the resolution of an Interactive Flat Panel. It is something that you need to consider. The resolution is part of how clear images are on your panel. Full HD refers to a resolution of 1920 x 1080 and is very much common place today in TVs for the home as well as Interactive Flat Panels. However, we are seeing that fewer and fewer people are offering HD resolution. You may find some end of life products that offer HD, but going forward, 4K is the way! UHD or Ultra High Definition is 3840 pixels × 2160. 4K is actually the cinema standard of 4096 x (unspecified). When you see 4K on a TV, it’s actually not true 4K unless you are at the cinema! Confused? What does this mean for the Interactive Flat Panel? The reality is that the resolution and the screen’s capability to be able to display at this resolution is determined by two things. Let’s take the computer aspect first – this is arguably the most important. If you choose to have UHD Interactive Flat Panels in your School or School District, you must make sure that the computers that you have are capable of displaying at this resolution. If they are not, then the image will not look as sharp and clear. Also, make sure your computer has dedicated video cards for UHD resolution. Otherwise this could dramatically slow down your computer. If you are not sure if your computers have them or not, I’m pretty confident in saying that they don’t. This means you will need to upgrade your computers as well as the Interactive Flat Panels, which is an additional cost you need to consider. Next is content. What I mean by content is anything that you are going to display on the Interactive Flat Panel from video to annotation tools to games. The ‘problem’ that we have at the moment in the industry is that the hardware is somewhat ahead of the software. Software developers and content providers are still producing a large amount of content in HD as opposed to Ultra HD. This is exactly the case when you look at the TV and Cable Channels too. While there are a small number of Sports and Movie Channels in 4K, most are HD. This means that if you are putting HD content on a 4K screen it is going to be interpolated or scaled so that 1 pixel is represented by 4 pixels – so the image will not look as good or sharp and you will not make use of the 4K resolution. On the upside, while I’m not a fan of the term “future proof” (as I don’t believe you can future proof anything, especially not in the technology industry) you will be safe in the knowledge that your hardware will be capable of displaying the 4K content when it is more readily available. All this said, with my manufacturers hat on, the trend that we are seeing from the physical LED panel manufacturers (if you remember I mentioned there are only a handful of these in the world) is that they are moving away from HD and over to 4K. If I were to predict what is happening in the market or rather what is going to happen, I would expect that during the course of 2019 there will be fewer and fewer HD offerings from manufacturers and they will be moving over to 4K – at TouchIT we only offer 4K now. A question you might now be thinking is “I’ve heard that 8K exists, what is it”? 8K resolution or 8K UHD is the current highest ultra-high definition television (UHDTV) resolution in digital television and digital cinematography. 8K refers to the horizontal resolution in the order of 8,000 pixels, forming the total image dimensions of (7680×4320). Like 4K, there is even less content available and it very much limited to the cinema at this stage. At time of writing there are no 8K touch screens on the market and I’m not aware of any manufacturer that is looking to release them due to the substantial cost implications. Do I need onboard Android? Onboard Android means that there is a built-in Android Operating System on the Interactive Flat Panel. This means that when you switch the Interactive Flat Panel on without having any computer connected to it, you will be able to browse the web, run an annotation program and other Apps that are available for the Android Operating System. The real advantage here is that there is no need for a computer to be connected to the screen. This is not a replacement for having a Windows, MAC or Chrome OS machine connected to the screen, as you can do so much more with them. But if you are just looking to visit a website or make some quick notes, the onboard Android OS is fine for that. To decide if you need onboard Android, you must ask yourself “how am I going to use the Android OS?” You may think that this is an easy question. You have a Samsung Galaxy Tablet or Phone and the Interactive Flat Panel is just a larger version of that. Right? Unfortunately, this isn’t the case. Most Interactive Flat Panels that have onboard Android OS do not have access to the Google Play Store. The reason for this is that the Google License is incredibly expensive. If you are selling a few hundred thousand tablets, it’s worth the investment. 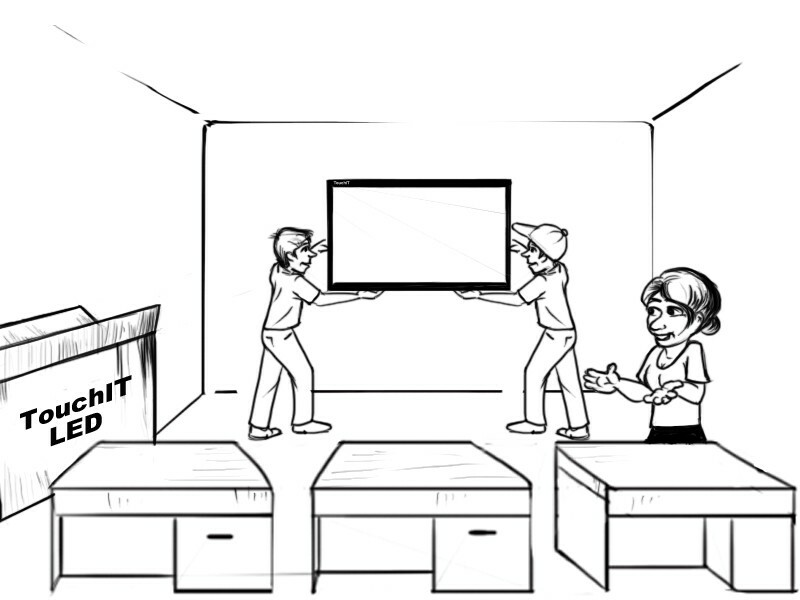 For the Interactive Flat Panel manufacturer, it’s simply too costly. Therefore, you must check what the particular manufacturer is offering in terms of Apps. Does the manufacturer have their own annotation App? Paint for example is of no use as an annotation and note taking tool. Therefore, if the Android OS is going to be useful, the manufacturer should have their own annotation App. Also, say you do have access to the Google Play Store. There are still some problems and considerations. Just because you can download an App, doesn’t mean that it is going to run well on the Interactive Flat Panel. Resolutions are much different on Tablets and Cell Phones so the Apps themselves have to be able to cope with the change in resolution – many can’t. With the millions of Apps that are available on Google Play, how can you ensure that only Applications that are suitable for your students are downloaded – very difficult to police. Also, whose Google account are you going to use to download the content from the Google Play Store? Whose credit card details are you going to add for paid content? All things that in a school environment are particularly difficult to put in place. One solution TouchIT Technologies has is our own App Store and launching January 2019 is the all new Version 2 that is linked to our Interactive Flat Panels to give you access to Apps that are suitable and tested on our products. All the Apps in our store are free to a school. No more worry about whose account you are going to use to download a paid app. With our own app store, we will be able to offer tested, relevant, content-safe Apps for our customers to download and use on their TouchIT Interactive Flat Panel. Without access to a store, the onboard Android will have very little value. Where do we start with Chrome? Chromebooks and Chrome OS have taken the education market by storm over the last 36 months. They are particularly attractive due to their low cost and simple browser-based cloud applications which make managing Chromebooks easier than Windows or MAC for school IT departments. Chromebooks are rapidly becoming the hardware of choice for schools. More Google Chromebooks are sold in the U.S. than Apple Macs, according to the latest figures from analyst firm IDC released in April this year. If all the students in a class are going to use the Chromebooks, you’ll want to be able to collaborate together and the LED will still remain the focal point of this. There are a couple of things to remember when thinking about Chrome OS and Chromebooks in the classroom. First, while Google announced earlier this year that Chromebooks will have access to the Google Play Store and be able to run Android Apps, this is not the case for all Chromebooks and it is not available for older models. There are only specific models -which tend to be near the higher end of the pricing scale – that can actually access the Play Store and the Android Apps. So, if you are planning to deploy Chromebooks in your school or district, and downloading Angry Birds for Android was high on your priority list, check the model with Google to see if they are compatible first. Chrome itself is designed for Cloud Computing. It is not designed to have lots of applications installed on the Chromebooks for the students to use. Therefore, when you are considering Chromebooks, you really need to compare your software strategy needs against what will run on them. Chromebooks by nature do tend to be very underpowered with just enough juice to run a browser and navigate the web, so these are not a direct replacement for MAC and PC machines. Chromebooks are no doubt a great tool and the access to information, resources, and the web that they provide to students at a low cost makes them very attractive to schools. Because the units are underpowered, double check with any hardware manufacturer that their hardware is supported on Chrome, as not everything is. It’s also worth checking that any software you plan to use is supported on the Chromebooks too. This Blog post is an extract from the eBook “Bring Back My Whiteboard!” – Written by TouchIT Technologies CEO Andi Brabin. Enter your email address below to receive your free copy.